parenting | Really??! parenting – Really??! I did one of those things yesterday that on the surface seems fairly meaningless, but made me take pause and think. I mixed together some crayons. Now, my kids are 14 and 10, and while we still have crayons in the house, they’re rarely used. Michael needed to color in some maps for a school assignment over the weekend, and when I was putting them away, I wondered why we had one small container of crayons, as well as a larger bin that wasn’t full. So I poured the crayons from the small container into the larger one. And then I stopped. You see, that smaller container held more than just a few crayons; it held memories. When Matthew was four, his preschool teachers did a unit on the states. Something about it captivated him, and he wanted more. We read books (Scrambled States of America became a fast favorite), did puzzles and played with state flashcards. In the midst of this, we took a day trip to the Crayola Factory, and discovered that a few years before, Crayola had made a collection of state crayons (imagine – Cornhusker Yellow, Aloha Aquamarine, and Tennesienna!). Though they had been discontinued, we easily found a box on Ebay as a gift for Matthew. He spent hours with map coloring pages and his state crayons. He sorted them. He laid them out on the floor. He used them for a while, then forgot about them, and they’d come out now and then when someone needed crayons for homework and didn’t want to pull out the bigger bin. Fast forward to yesterday. I only paused briefly before dumping the state crayons into the container where they’d mingle with the rest of the regular Crayolas that had been collected from the big box of 64 crayons and leftovers from school pencil cases and the end of each year. I was immediately hit with a pang of regret. Those crayons were more than just something my kids used to color. They were special. They were a part of who Matthew was at the time, and who he continues to become. 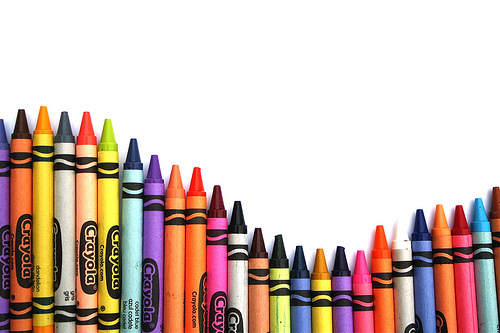 But I realized that just like the crayons, these experiences mix together to create who we are and what we love. Keeping them separate wouldn’t bring back that sweet time, or strengthen the memories. So I decided to let them go. Sometimes, I find that it’s difficult to know what to hang onto, and what to let go. But yesterday, I think I learned that letting something go doesn’t mean that I’ve diminished its importance. I’m just going to take the memories and the crayons, put them all together, and move along with these wonderful people my children continue to become.